America is a land of opportunities and prosperity, it welcome new immigrants with open arms and embraces them as citizens. “Give me your tired, your poor, Your huddled masses yearning to breathe free, The wretched refuse of your teeming shore. Send these, the homeless, tempest-tost to me, I lift my lamp beside the golden door!” writes the poet Emma Lazarus but yet these sentiments weren’t expressed to the Chinese immigrants. 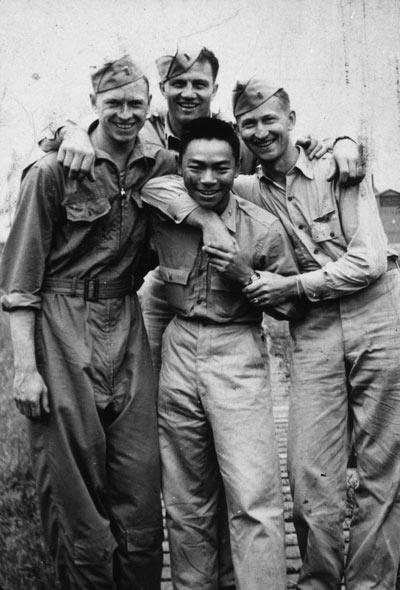 The Chinese American experience was very much different from their European counter part, they were the most marginalized and most discriminated against. They became victims of government sanctioned bigotry and injustice. For the first time in American history, they became the only nationality to be excluded from the country. The Chinese first came to America around 1800’s, when Chinese sailor had visited the port of New York City. The migration of Chinese immigrant didn’t occur till the discovery of gold in California in 1848. The news of gold spread quickly when Chinese miner return home with their new found wealth. The returning miners were able to buy land, built houses, and live a more luxurious life with their family. The promise of “Gold Mountain” which the Chinese called America prompted the great migration. The Chinese were first welcome to the America, and they were appreciated for their hard working and artisan skill. The Chinese shared the same protestant work ethic like other American, believing in working hard and achieving wealth, made them very welcome to California. The early immigrants were artisans, merchants, businessman and diplomats to the United States, They tended to settle along the west coast of the United States and settle within their ethnic enclaves called “Chinatown”. The news of gold in California brought many unskilled Chinese immigrants to the states. Many of these immigrants were welcome by the six companies that made up the Chinese mutual aid society. This society helped with finding jobs, healthcare (eastern medicine) , housing and education for the new arrival. The Benevolent society created a middle man for relations between the Chinese immigrants and America. They provided a social welfare system for many of these immigrants at a time when such a thing didn’t exist in America. The growing anti-Chinese sentiment became more inflammatory when American missionaries in China stereotyped the Chinese as immoral, dishonest, cunning ,cruel and superstitious .Americans were also viewed these new immigrants as coolies, the term is like indentured or slave like labor. The British had captured, kidnapped or trick Chinese peasants into servitude sending them to Australia, Indies, Peru and Cuba work on British plantations. The coolie trade is comparable to Africa slave trade, making Chinese immigrants look inferior to Whites. By 1852 Anti-Chinese fear hit a new high, a new legislation and taxes were solely targeted against them. The first tax against them was the foreign miner’s tax, charging the Chinese miner 2 dollars for the first year and 2 dollars each cumulative year following without a maximum. With this tax, the state of California received a quarter of its revenues from the Chinese miners for the year and between 1852 and 1870 collected 58 million dollars. The new tax and claim jumping from whites, basically force many Chinese miners off their mines. The recourse to the law was often ignored due to prejudice and injustice legal system. Some Chinese fought back to take back their mines, while other banded together and worked on exhausted mines abandon by whites. Their hard work and perseverance often paid off, extracting what small amount of gold was left. Amazingly mining companies hired these former Chinese miners to build water pipes to support the mining equipment, since whites didn’t want the job. In 1879 the city of San Francisco had passed a law banning the hiring of Chinese to corporations and municipal and authorizes cities to remove Chinese resident from within the cities to specific outlying areas. This act was struck down and ruled unconstitutional by violating the 14th amendment in 1880. The most notorious law ever passed in American history was in 1882, fueled by anti-Chinese rhetoric, pressure from union labor and political parties playing on nativist fears, the United States passed the Chinese exclusion Act. For the first time in American History, the open door policy was closed to a specific nationality. At first the law only banned labor Chinese but by 1888, this included all Chinese from entering the United States. Unable to make it home. Back in China, the wives of the gold mountain miner waits like a widow for their husband return, not knowing when. The Chinese tradition has often been for the wife to stay home and take care of the family, and take care of their old parents. The money they received from their sojourner husband might improve their lives, but the distant apart and not knowing when you see your love one is like a curse. As one Chinese women poem writes. You haven’t thought of me for twenty long years. It’s wrong for lovers to be separated in two places. You don’t feel a thing for your poor wife. You care only for your fun and games outside. The assimilation of Chinese to American culture was extremely hard , the Chinese were often look down at by whites as inferior. Intermarriage was banned in many states, anti-miscegenation was the law of the land. Marrying between a citizen and a Chinese would result in loss of citizenship. For the Chinese bachelor marrying a non-citizen such as blacks or polish was an alternative. Having a family was the biggest success in a man’s life, to become a bachelor the rest of your wife was equal to failure in life. Jobs and employments were often few and far in-between as whites jealousy for jobs often threaten gave death threats to Chinese workers, or threaten to arson the businesses that hired them. The Chinese gathered in groups to protect themselves, while other never really unpacked their belonging knowing at any time a mob of whites will drive them out of town. This extreme discrimination and prejudice drove the Chinese to menial labor jobs that whites won’t do. 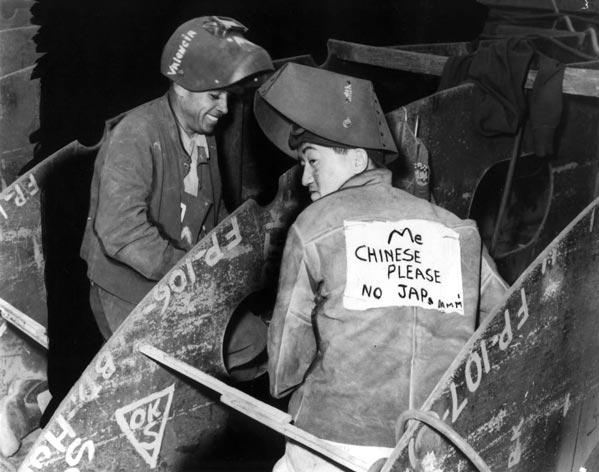 The new hatred for Japanese often became violent and targeted anyone of Asiatic appearance, prompting Chinese American to wear signs so not to be the fury of angry whites. Education was at first denied to the Chinese, they were given the separate but equal system of Jim Crow law.They were separate but there wasn’t any equal, no schools were actually built for them in San Francisco . The Chinese were also discriminate in this separate school when blacks refused to go to the same School as the Chinese, who they viewed to be inferior. The parochial school served as an education institute for many students until opening of missionaries school in China Town. The opening of the missionaries school, the next generation of American born Chinese were able to be Americanize and slowly assimilate. For the new Chinese American generation, the cultural identity of Chinatown did not register for them, they viewed themselves as American. Chinatown became only a place of tourist, or visiting the older generation who still resides there. Even with their Americanization, the Chinese were discriminated against . They were kept out of the mainstream, and turn down for jobs they were qualified for. American Discrimination continued to play a key factor in keeping them moving upwards in society. The 1960 became the civil rights moment that open up many doors for not African American but also Chinese. The promise of the Great society to end poverty and racial injustice allowed more opportunities for Chinese American integration. Once considered inferior, evil, cunning and fugal, the Chinese were given the perfect minority model by whites. This used of the positive stereotype made it seem as if the Chinese were never disenfranchised or discriminated against. The stereotyped also says to other minorities group why you can’t be like the Chinese, quiet, humble and accept your place. While other stereotype such as academic savvy and over achiever status created barriers for Chinese student, denying them admission to selective colleges. The SAT would handicap an Asian student by -50 points. The Chinese American success was treated in the same way that Jewish American had been treated earlier in America. The Chinese contributed greatly to America frontiers and agricultures. 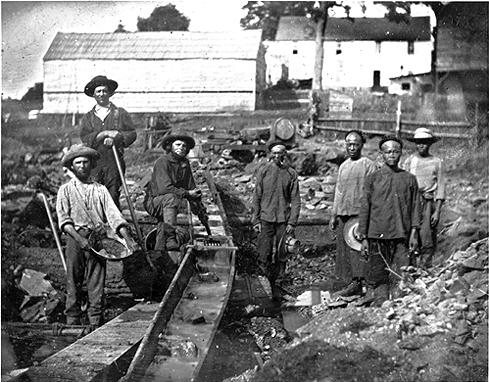 During 1860s, 1 out of 5 Chinese worked on building the transcontinental railroad. The work ethic and dependability of the Chinese help carve the mountains of the sierra and finally connect the railroads in Utah. About 11,000 Chinese were employed by the railroad company to help finish this incredible feat of human engineering. After the railroad the Chinese labor would be put to good used building the levee system throughout California. The Chinese protestant work ethic and cheap labor supplied the necessary building block for America, much as the second wave of immigrants had for the industrial revolution. Furthermore Chinese cuisine has become as much a part of American diet as the hamburger or the hot dog. The Chinese immigrant brought along the delicious dishes of their homeland. Each Chinese dishes is distinct depending on the region of their origin. This introduction happen in 1849 with the opening of first Chinese restaurant Macao and Woosung by Norman Asing. This was the first ever all you can eat Chinese buffet, charging a dollar to the hungry miners. Dishes like “chow mein” and “chop suey” became common American cuisine. Eating Chinese food became adventurous and exotic for white American. Another major impact of Chinese immigrant is the ethnic enclave that had been a refuge for many new immigrants. The Chinatowns of the San Francisco and New York City have become tourist destination now. These ethnic enclaves attract tourist from all around the states to experience what these community look like. Secondly the Chinatown became historic symbols of America immigrant community that help build this great country. Chinese American have long been a great part of the American identity, as much as history thinks of them as sojourner. The Chinese were involved in every step of building this nation, from building the railroad to levee system of California. In the process of serving this country, they gave their ultimate gift by fighting in the Civil war to World War 2 and every war since. In architecture one of America most famous monument the Vietnam War memorial was design by a Chinese American name Maya Linn. In 1996 Time Magazine named the man of the year Dr. David Ho for advancing the treatment of HIV virus. Further proof of Chinese contribution came in elegant white, when Vera Wang became the obsession of desire for American brides. The Chinese experience is unlike any other immigrant struggle for assimilation; they faced a systematic discrimination by America that no other nationality had to deal with. They became victims of political violence, blaming them everything wrong in America. They were driven out from cities, town and neighborhoods by white mob racist. Yet despite the odds, and the stack deck against them, they stayed, overcame and belong to America. Olson, S. James and Heather Olson Beal. The Ethnic Dimension .